Here are a couple of pictures of our elk season so far. My personal hunting has been pretty slow, two bulls have been within shooting distance but neither presented a shot. The wind is my eternal enemy. Tom got a nice big cow on the opening week of the season. His three blade VPA Terminator broadhead slipped between the ribs on the near side and obliterated a rib on the far side, resulting in an almost complete passthrough. Tom used his Hawk recurve to kill this cow. Dale (left) was leading the three man procession through the woods when Danny spotted a group of elk coming straight towards them. Danny was in the middle, and Tom was in the back of the group which allowed him to slip an arrow out. Dale is a lot of things, but he also makes a pretty good tree because he had elk within three feet of him. He just spotted antlers coming up and over the hill when he heard a bow go off behind him. Elk scattered everywhere. He must have been a little peeved for a second but even a tree would have had a hard time getting an arrow out in that circumstance. With the erratic winds they were experiencing they all agreed it was a miracle to get a shot off anyway. A pretty cozy little home when it comes to elk camps. Unbelievably - a tree fell directly on the tent in the middle of the night. It sounded like a .44 being shot which jolted Dale out of bed. The top of the tree smashed into the tent's crossbuck and landed right in the bed that Dale just got out of. The crossbuck broke in two and landed 5 inches from Tom's head. Danny's side of the tent was totally unaffected and so was his sleeping. Miraculously nobody got hurt. Wallows like this were everywhere. The mountain's bounty, including wild strawberries, grouse berries, goose berries and brook trout. Not an elk to be seen but the view itself was worth the hike. Just a few miles from where I saw lots of old tracks and only a few live elk my cousin Chad was having the time of his life. In just two evenings of hunting Chad and his cornhusking companion Blake tagged out with two fine bulls. Blake isn't much for gambling, he likes sure things - like six foot shots. And he'll get them when hunting with Chad because Chad has a rabbit's foot shov....well, lets just say I've seen him in his longjohns so I have a good idea where he keeps it. Nice job to both of you guys! 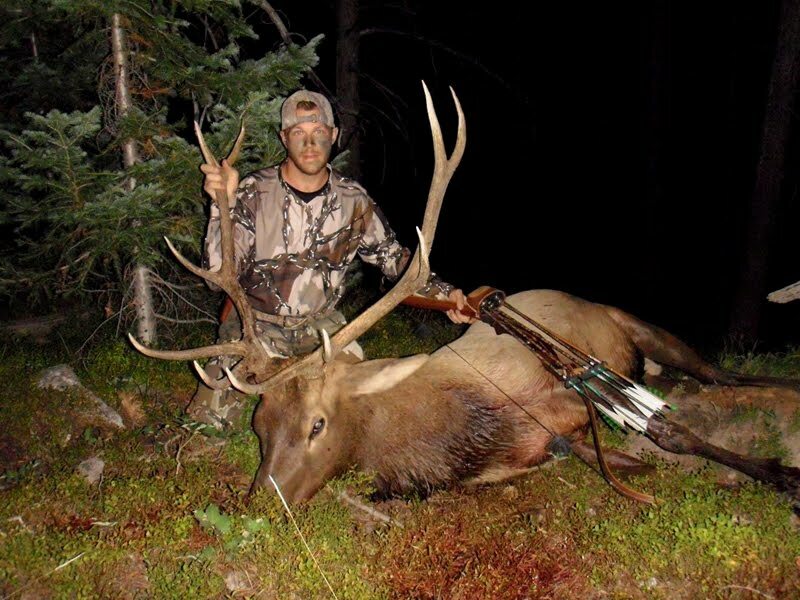 Chad (above) used a Bassett recurve and a Magnus Stinger 4 blade broadhead. 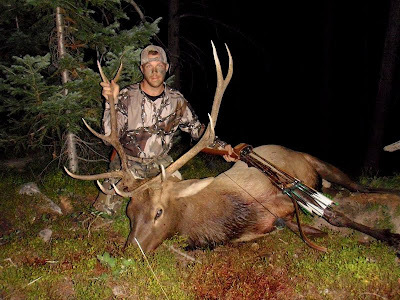 Blake killed his elk with a Robertson recurve and a Grizzly broadhead. Both had excellent bloodtrails.